One flavor of a high frequency switching transformer is known as a push-pull transformer. A push–pull transformer is a DC-to-DC switching transformer; it is often used to change a power supply’s DC voltage. These power supplies are known as switched-mode-power-supplies (SMPS). Older, linear power supplies often used low frequency, heavy silicon steel type transformers to step down incoming line voltage to something smaller that was then rectified and filtered. 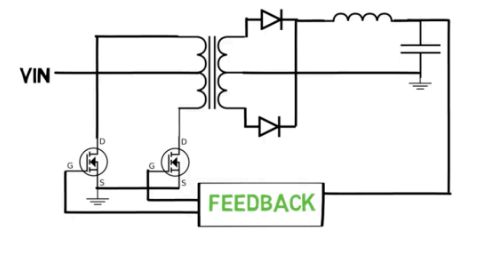 We’re going to design a fairly simple push-pull transformer. See the diagram below. That should be enough. Now we’ll choose a core that seems reasonably sized for this 24VA transformer. Let’s go with an EE22 sized core. This core has an area of 36.26mm^2. A typical bobbin for this core has an available window area of 30.34mm^2. Now let’s choose the wire sizes based on a safe ampacity of 2A/mm^2. 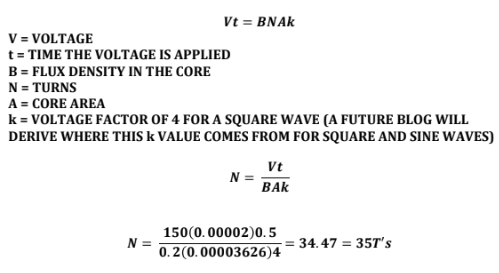 Ok so the 150V is applied to one half of the PRI for a period of time, then the other half for an equal period of time. That time is not exactly 50% of the period of switching though as there must be a little bit of time when each transistor is off to ensure they are then never on at the same time. There will also be times when the load is perhaps low, meaning the transformer is not required to deliver 24VA of power. During those times the duty cycle is decreased even further. The core we will use will be a fairly standard ferrite power material who’s MAX flux density is about 0.48T. We are going to take the ~ 0.7V diode drop into account and add this to the output voltage. So this is what we have so far….. This assumes a duty cycle of 50% but as we already said this is the MAX duty cycle and the actual duty cycle will likely be smaller. The length per turn around the bobbin (found on the bobbin spec) is about 0.0432m. The DCR of the SEC is therefore ~ 9.27mΩ. Which means we will lose about 9.27mV @ 1A. The DCR of the PRI is therefore ~ 0.32Ω. Which means we will lose about 0.051V @ 0.16A.